Also, according to Tony Pauline potential day two safety Taylor Rapp ran a disappointing 40 with a fastest time of 4.72 and Myles Gaskin's 40 was also a disappointing time of 4.56. However, defensive lineman Greg Gaines dropped his time from 5.15 at the combine to 4.99. Edge rusher Jabril Frazier and quarterback Brett Rypien also have a chance to be drafted. Washington State's two top prospects, tackle Andre Dillard and quarterback Gardner Minshew II, just did field testing and both reportedly looked good. Potential late round running back James Williams did strength and agility tests after missing them at the combine due to a shoulder issue. He posted a solid 15 reps in the bench press. Williams is one of the most productive pass catchers in the nation over the past few years and is being mentored by NFL legend Eric Dickerson. Finally, at Stanford, the main attraction was JJ Arcega-Whiteside, who was unable to work out at the combine. He lived up to the hype, according to Pauline. Receiver JJ Arcega-Whiteside [...] tipped the scale at 223 pounds and posted 40 times which ranged from the mid 4.4s to the mid 4.5s. The consensus on Whiteside was 4.48 and 4.49 seconds, which was much faster than most expected. His other marks included a vertical jump of 34 inches and a broad of 9-foot-10. [He] looked terrific catching the ball and showed soft, strong hands. He solidified himself as a second-round choice. While tight end Kaden Smith just did position drills, another potential draft pick had a good day. 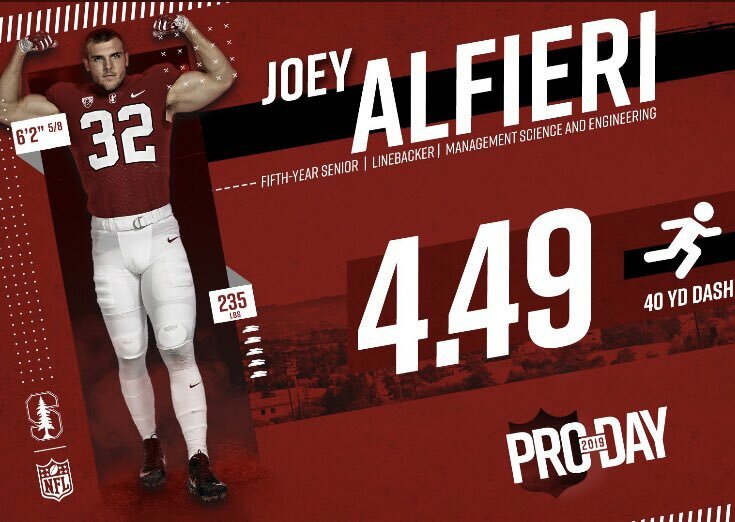 Bobby Okereke, Stanford's other linebacker and a fifth-round prospect on our board, timed 7.08 seconds in the three-cone and 4.21 seconds in the short shuttle. Both times were vast improvements from his combine marks. He also completed 16 reps on the bench press, a good number for someone whose arms measured 34.5 inches at the combine. Other potential draft picks from Stanford include running back Bryce Love (injured), center Jesse Burkett (23 bench press reps) and guard Nate Herbig.